Peter Weckauf was born in Vienna in 1963 and started to learn Martial Arts when he was 15. He is certified in adult education and is an officially recognized and certified security expert as well as renowned self-defense instructor and has taught courses all over the world. Peter Weckauf is a recognized authority in both armed and unarmed self-defense. As head and founder of SAMI Combat Systems (SAMICS) he can look back at has 40 years of experience and extensive knowledge on the subject of self-defense and martial arts. His love and passion for martial arts have inspired him to make SAMI Combat Systems available to a broader audience. 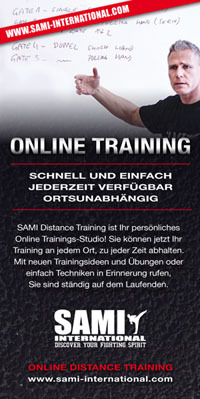 There are currently SAMICS qualified instructors in around 40 countries. He is currently teaching various courses and seminars to professional groups, law enforcement and private individuals and is the author of a series of books and DVDs on Krav Maga, Security Krav Maga and SDS Concept.